Should the moratorium on logging since 2002 in the Democratic Republic of Congo (DRC) be lifted and concessions issued for industrial-scale logging? This conservation resource was created by James Bergal; Julian Burke; Won Jung Kim; Marko Zlatic. It is shared under a CC-BY 4.0 International License. Map of the Democratic Republic of the Congo. By United States Central Intelligence Agency via Wikimedia Commons. Public Domain. The Democratic Republic of Congo (DRC) is located in central, sub-Saharan Africa and neighbored by ten different countries. The country possesses a small portion of shoreline on the Atlantic Ocean between Congo and Angola. The population of the country is 79 million. Of this population, 33% is considered to live in urban areas while 67% is considered to live in rural communities, which is far different from international averages. For the region, the DRC is of a large size and within this spacious interior, is vast swaths of rainforest and mineral resources. Despite these resources, the DRC maintains as one of the poorest countries in the world. 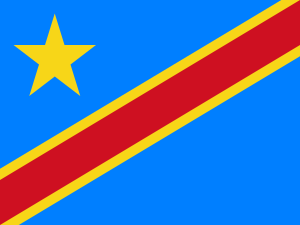 Flag of the Democratic Republic of the Congo. By nightstallion via Wikimedia Commons. Public Domain. The DRC has a history of political climate which is highly influenced by civil war, general civil unrest, and poverty. This continuing state of unrest has been credited with maintaining the impoverished state of the nation despite natural resource wealth. The DRC first gained independence from Belgium via. civil war in 1960 and was taken control of in 1965 by Mobuto Sese Seko. He held this power in a dictatorial fashion for thirty-two years until rebel forces ousted him. General unrest persisted in the country until the new government was able to seize control in the early 2000's. As recently as 2016 civil war still persisted in some regions of the DRC, particularly the eastern region. The rainforests that the DRC possess are some of the most vast in the world. In fact, the rainforest found in the DRC is the largest contiguous block of tropical forest in Africa and the second largest in the world. As expected, with this vast expanse of forests, also comes extremely high biodiversity. The forests of the DRC are home to some of the most diverse populations of mammals, birds, and fish in the world. In addition to this animal diversity, the tropical forests of the DRC are also home to an extremely high diversity of plant species. Over 3000 of which are endemic to the region. Meaning that if the forest were to be lost then these species would be lost along with it. Unfortunately, in the past these forest resources were extracted as a means of funding wars. This is what people have come to know as a "conflict resource". That is when a resource is extracted solely for the purpose of funding an armed campaign against a government. Typically these resource extractions are associated with the mass bloodshed of innocent people and human rights violations. Within modern history, these conflict resources tend to be located in post-colonial countries within the continent of Africa. In the year 2002, after facing international pressures (particularly from the European Union), a logging moratorium was put into place by the DRC. The intended purpose of this moratorium was for two purposes. The first being as a method to curb the means in which the civil war was being fought. Reducing the logging concessions an attempt to stop the export of conflict timber and the associated bloodshed that comes with it. The second reason for the logging moratorium was to preserve the diverse forests that a significant portion of the DRC's population relies heavily on. These diverse forests provide the necessary ecosystem services which maintain these peoples way of life. The formal definition of the term moratorium is a delay for a certain period of time in the performance of a legal obligation. During the early 1900s in Newfoundland and Labrador, overfishing of cod species resulted the Canadian government to establish cod moratorium in 1992. As fishing technology developed, the number of cod getting caught was increased by a lot. Back then when overfishing occurred, the fishers caught an excessive amount of cod because the concept of wildlife reserve was not fully established by the nation and government. Since the idea of conservation was not introduced, the locals in the marine area overfished the cod because they outweighed the economic values over ecological values. Another reason why cod were almost extinct was because they migrate in as a huge mass to the inshore. When cod migrate as a large pack into the inshore, the fishing boats would grab most the whole pack by using the colossal trawler nets. This was a method of factory fishing. This have positively influenced the efficiency of fishing and the number of cod getting caught which eventually resulted in a large decrease in total population of cod. As the number of total population of cod decreased, the concerns about overfishing was increasing. To resolve this issue, a new quota was established. The quota was about the maximum amount of total fish that could be caught. This was also known as the Total Allowable Catches (TAC) for northern cod was introduced in 1970s. Despite the new quota, the number of cod getting caught and decrease in overall population were still in an upslope. This is mainly because Canada overestimated their surveys when establishing the Total Allowable Catches. In a matter of fact, because of the constant overestimate with surveying, the “TAC was constantly increasing from 135,000 tonnes in 1978 to 266,000 tonnes between 1984-88.” As a result, the overfishing of cod species was still on a rise eventually resulting the cod stock to collapse. In the early 1900s, the stock kept declining to a very low level resulting in the Canadian government eventually deciding to assign a moratorium on catching cod. As mentioned above, there is a history of resource extraction events in Africa which have been used to fund civil war, oppression and bloodshed. A few of the countries involved in these bloody events are Nigeria and Sierra Leonne. These countries fit the exact definition of conflict resources and learning from past instances of conflict resource extraction must be done in order to develop solutions to conflict timber in the DRC. Sierra Leonne is located on the Western coast of African and has a long standing history of corruption in the Diamond trade. The company de Beers, whom owns two-thirds of the diamonds in the world, signed a contract which gave them exclusive rights to diamonds in Sierra Leonne for 99 years. This created a practice of diamond smuggling into the neighboring country of Liberia and set the grounds for further illegal trade. Fast-forward to 1991 and the government was corrupt and had created corporations to produce diamonds illegally and then smuggle them through Liberia for profit. This created unrest and discontent with the populous and the movement of rebellion called the Revolutionary United Front (RUF) was started. These rebels led armed rebellion against the government and focused their efforts on controlling the diamonds mines. The diamonds were used to fund war in purchasing of weapons and supplies using the old methods of smuggling diamonds. Eventually, with the assistance of the U.S. and the UN, a peace agreement was signed and the war and attacks from the RUF stopped . Unfortunately the peace only lasted seven months before the violence began again . As mentioned above, lessons from Sierra Leonne can be applied to the DRC. Fortunately in the case of the DRC, corruption and illegal logging have not been an almost 60 year tradition as it was in Sierra Leonne. What can be learned from the situation is that, while a forceful hand and international pressures have helped in Sierra Leonne, they did not achieve the end goal. In relation to the DRC, the moratorium, which was influenced by international pressure, has had successes, but also illegal logging persists still. This potentially gives rise to other solutions such as aiding the government in policy design and decision making but not pressuring them to make a decision based upon the values of outside nations. In the niger delta region of Nigeria, significant Oil reserves were discovered in the 1980's. Over time the production of Oil accelerated and oil companies such a Shell and Mobil began to intensively extract oil and produce profits from the region . This caused unrest with indigenous groups of the region, which today number over 1 million in population. The unrest and discontent with the proceedings was due to the fact oil companies were making high revenues off of their lands and they were not seeing the returns of the production . Eventually this led to, what was at first non-violent and peaceful protests in the region. The government of Nigeria poured gasoline on the fire by making the decision to publicly hang 9 of the major activists . This act of aggression from the government began organization of violent acts from the protesters. They named themselves MEND and dedicated themselves to delaying, and reducing the situation of oil production in Nigeria to the point it could no longer continue<re name="oil"/>. The means by which they funded themselves were through kidnapping for ransom of rich individuals, and high-jacking of oil supplies or oil tankers and selling the oil to fund their rebellion. Through appeasement measures and buyouts the government of Nigeria, in accordance with oil-companies was able to arrive at a ceasefire and settlement. This effectively disbanded many of the rebels and their leader was tried for terrorism in South Africa. After this trial and conviction, the rebels began to fight again and despite being much smaller in number than before, have reduced production in Nigeria again. Today appeasement talks are in progress and the government believes that through negotiation the conflicts can be solved with the help of the oil-companies. Given that the situation in Nigeria was resolved at some point, the government and other international bodies involved in the DRC can learn greatly from the peaceful ceasefire in Nigeria. This could serve as a model for the government to attempt to negotiate with the people in order to find some sort of appeasement to the issues they are upset with. Additionally, industry provided meaningful input into the resolution in Nigeria and the DRC could use the power of the forestry industry to help solve conflict timber in the DRC. Lastly continued monitoring of the conflict in Nigeria and assessment of appeasement techniques and results will provide useful information and insight for the government of the DRC. An old-growth forest in the DRC. By Earwig via Wikimedia Commons. Public Domain. Much of the Congo Basin rainforest is old-growth forest. This means the forest provides specific ecosystem services that are invaluable to surrounding ecosystems and the people that live in/near the forest. Some of these ecosystem services include oxygen production, purification and storage water, carbon storage, generation and regeneration of nutrients, and countless others. Carbon storage alone within the DRC’s rainforests accounts for 27,258 million tonnes of stored carbon . This has huge implications on the global climate, seeing as if this carbon were to be released due to deforestation, it would then contribute significantly to climate change. Old-growth forests are also very rich in harvestable resources, such as tree species that are limited to old-growth forests, and many valuable animal species that are hunted/poached . The DRC possesses lots of land that is very rich in resources, but what is seldom understood is that these resources are not as important as the ecosystem services provided by intact rainforest. This becomes even harder to understand in a county in constant political conflict, and where poverty and need for incomes is predominant. While the resources present in the old-growth forests in the DRC are usually very environmentally damaging to harvest, that does not mean they should be completely ignored. Much of the timber production, hunting, fishing, and mining done in the DRC can be done in a much more sustainable way, if efficiently and well managed. Even though traditional ways of life are evolving in the DRC, many groups of people still rely on the rainforest and old-growth forests for subsistence. Around ten percent  of the DRC's population relies on some form of a hunter-gather relationship with the rainforest. One specific example of this would be the Baka people in the northwest of the DRC, who hunt and gather during the dry season and grow crops during the wet season. Agriculture is practiced within the forest by clearing small patches of land, growing crops for around two years, and then leaving the patch of land for a long fallow period to regenerate soil health. While this way is becoming less and less common in the DRC, it would not be possible without old-growth forests. Under the current Republic of the Congo Constitution, natural resources, including forests, are State property . However, the State grants logging rights for these lands to private entities . As a result, much logging that occurs within the private entities are derived illegally as many locals can gain much wealth just from a harvested tree with little regulation and taxes. Due to the low economic state, the Republic of Congo is enduring, it should be advocated for easier towards logging privileges and proper forest management procedures to insure an increasing economy. By encompassing more of the land for public use, taxing and encouraging the locals to "pay as they go" with their lumber will promote a more sustainable route for tree harvesting. The trees can then become taxed and profits will be made. Due to the abusive logging techniques used by the local people of the Republic of the Congo, their yield rate (percent of profitable trees harvested) is very low ; much of their natural resources are wasted. As a result from the unsustainable, illegal, logging, many parts of the Republic of Congo forests aren't regenerating quick enough to gain profit (if at all). Ultimately, the local people lack the education and tools for better harvesting and forest management techniques; partly due to the fact the government doesn't allocate enough tax dollars and government resources towards awareness of unsustainable, illegal, logging. BC alone has 32% ($14.1 billion CAD) dedicated to their total exports . The reason for BC's success with its lumber industry is due to the provincial government owning over 90% of the land. This is extremely useful as the provincial government can monitor, direct companies and efficiently regulating the land for the peoples understanding (protection); a rather sustainable approach to logging. With the vast biodiversity of trees within the Republic of Congo, its imperative to implement some sort of practical logging system where the local government can claim most of the land and implement sustainable management to forest and forest systems; ultimately, promote more regulation in regards to logging and spread awareness to its people about proper harvesting and regenerative periods for forest growth . The final summation in regards to the benefits that the Republic of Congo will gain from logging is mainly to promote sustainable profit and awareness. By having the localized (provincial) government obtaining much of the land. They would then be able to tax the land and use its tax dollars to invest in better forest management tactics and government resources for its people (financial aid, medical care, and education). By having an active localized government, the local people will be able to profit more. Of the thousands of various species of trees, two families stick out as the DRC's most resourceful and practical implications: burseraceae and caesalpiniaceae . The two main morphological features that give caesalpinaceae its unique structural pattern arises from hardwood morphology; its mainly used to make fencing or other structures that requires it to be flexible, yet sturdy. Due to the economic tension within the country, caesalpinaceae trees are heavily used as cheap aluminum simply is too costly. Morphology of Canarium tramdenum C.D.Dai & Yakovlev species in the Burseracea family. By Francisco Manuel Blanco via Wikimedia Commons. Public Domain. The burseraceae family is heavily used to to its interdisciplinary applications as its used for incense, medicine and embalming . With its broad spectrum of uses, the burseraceae family is considered one of the most demanded family of trees within the DRC. An example of a tree within the burseraceae family is Bursera simaruba, or incense trees. Incense trees are used by the locals for religious practices as the incense are told to relax ones mind energy. All and all, both the burseraceae and ceasalpiniaceae families are heavily marketed are diverse in applications and reliable to withstand any tropical condition. Their thick resin ducts are well insulated due to their thick sap that protects them from invasive species and help make symbiotic relationships in the process. Although there are immense applications for the families, proper conservation of the two families is imperative if the populations are to remain stable for future generations. The final summation of the moratorium on logging since 2002 in the DRC illustrates a clear indication that the moratorium is unsustainable, however, headed towards the right direction . The purpose of the 2002 moratorium was to help alleviate the civil war and lower the violence when disputing for logging territory. Although the DRC has extremely dense and large tree populations, the rate in which the country demands from its resources is exceeding its replenishing rate. Old growth forests in the DRC are still stable and healthy, however, are approaching its first potential disturbance in the near future. Educational enforcement is need when approaching this topic due to the level of education of understanding forest systems and resource management is quite intensive and required. Having the locals understand the difference between the burseracea and caesalpiniaceae families can help them distinguish them quicker in the wild and lowers the chance of error; making harvesting more efficient and practical. With such a violent desperation for natural resources, especially lumber, logging should be advocated for the DRC to implement. With inefficient harvesting critiques for lumber, much of the locals yield is far below the sustainable marker. Instead of suppressing such logging rights, they should implement more education and outreach towards how to harvest wood, ultimately, maximizing their profits and promoting sustainable forest growth over the years . Regulating, educating and sustainability are all concepts that need to be taken into account in order to successfully establish a strong and rapid lumber industry with maximum efficiency and health of forests; knowing which trees and species of tree make a huge difference in promoting plant diversity (a key importance for stronger and durable wood). Overall, the DRC has violent civil war that has been precising for some time now. This, in turn, requires the country to deplete its natural resources at an alarming rate, mainly in regards to lumber. Obtaining proper harvesting techniques will increase wood yield and lower waste, ultimately, decreasing the rate of logging. Understanding the morphology of the trees and the ecosystem in which it inhabits creates a security in tree diversity and strength. Implementing proper governmental resources to better prep its people for harvesting will create a huge impact in increased yield rates and greatly lowers the regeneration periods of forests. Although the moratorium is a good idea to start with, there its still much work to do; much of it derives from educating its people and having them take ownership for their local environment. ↑ 1.01.11.21.31.41.51.6 BBC.com. (2017). DR Congo Country Profile. Available at: http://www.bbc.com/news/world-africa-13283212. [Accessed 3 April 2018]. ↑ Washplus.org. (2010). Democratic Republic of Congo: water and sanitation profile. Available at: http://www.washplus.org/sites/default/files/drc2010.pdf [Accessed 3 April 2018]. ↑ 3.03.13.23.3 Lambertini, M. (2000). Available at: http://www.press.uchicago.edu/Misc/Chicago/468283.html [Accessed 3 April, 2018]. ↑ 4.04.14.24.3 Yale.edu. (2018). Illegal Logging in the Congo Basin. Available at:https://globalforestatlas.yale.edu/congo/forests-and-logging/illegal-logging. [Accessed April 3, 2018]. ↑ 5.05.15.2 Global Policy Forum. (2007). Definition of Conflict Resource. Available at: https://www.globalpolicy.org/home/198-natural-resources/40124-definition-of-conflict-resources.html. [Accessed April 3, 2018]. ↑ 6.06.16.26.3 AFK Insider. (2018).Congo Basin Countries Struggle to Curb Conflict Timber. Available at: https://afkinsider.com/27508/congo-basin-countries-struggling-curb-illegal-timber-trade/ [Accessed April 4, 2018]. ↑ May, A. (2009). The collapse of the Northern cod. Newfoundland Quarterly, 102(2). Retrieved April 11, 2018, from https://www.mun.ca/harriscentre/reports/nlquarterly/NQ_article_Vol_102_No_2.pdf. ↑ 16.016.116.216.316.416.516.6 Johnson, E. (2009). Blood Diamonds - The Conflict in Sierra Leonne. Avaliable at: https://web.stanford.edu/class/e297a/Conflict%20in%20Sierra%20Leone.htm [Accessed, April 4 2018]. ↑ 17.017.117.217.317.417.517.617.717.817.9 Hallmark, T. (2017). Oil and Violence in the Niger River Delta isnt Talked About Much but has Global Impacts. Available at: https://www.forbes.com/sites/uhenergy/2017/02/13/oil-and-violence-in-the-niger-delta-isnt-talked-about-much-but-it-has-a-global-impact/#330556a74dc6 [Accessed April 4, 2018]. ↑ WWF.org (2017)http://wwf.panda.org/what_we_do/where_we_work/congo_basin_forests/the_area/wildlife/plants/[Accessed 6 April 2018].